Some cities have fall to the hordes of darkness, while others have stood, but in the countryside humans have to face the creatures of the dark on their own terms. In the lawless exurban regions the beasts can wreak havoc like never before. 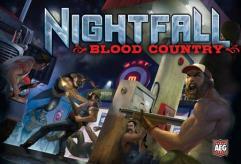 The Nightfall: Blood Country Expansion is set in the hinterlands and composed of entirely new cards with special powers featuring new vampires, werewolves, hunters and ghouls. Blood Country also introduces innovative uses for wounds that can create effects beyond those on the cards.